Every company in the world faces angry customers, no matter how exceptional they are at what they do. Whether you’re a solopreneur or part of a larger team, it’s inevitable you’ll one day find yourself on the phone listening to an irate voice on the other end of the line. Sometimes the issue really is your fault while at other times it might simply be a misunderstanding or an accident out of your control. 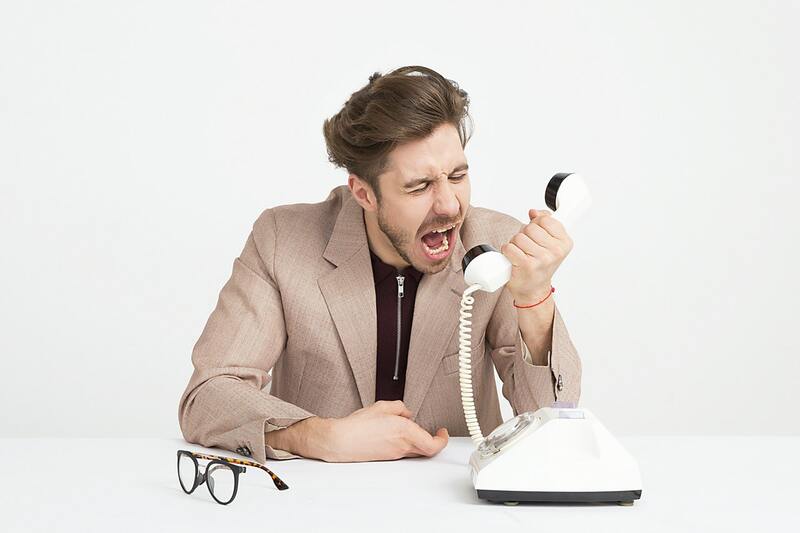 Regardless of the reasons, it’s vital to implement ways to deal with angry customer calls ahead of time. As a result, when they do happen you’re then better able to handle the calls successfully for the benefit of both the customer and your brand’s reputation. It’s easy to react to anger with anger. We naturally feel defensive about our business and to have a customer criticizing our products or services can feel deeply irritating. However, to react badly to a customer complaint will only exacerbate the situation and potentially damage your whole reputation. Whatever you do, remain calm. Speak gently but assertively and with confidence. Practice patience and never rush to finish the call until the problem has been solved. When you hear an angry voice on the other end of the line, automatically accept, on the spot, the right of the customer to be angry. There may very well be a good reason for their frustrations and it’s for the benefit of your business that you hear them out. Accepting and understanding why the customer is angry will allow you to assess whether the complaint has merit and how you can fix the underlying issue or communication error. There’s nothing more frustrating for an already angry customer than to feel they are not being listened to. Customers can perceive whether you’re treating their call as an inconvenience. It’s imperative to genuinely listen to the caller’s concerns, word for word, and comprehend fully why they are making a complaint. When you intentionally set about actively listening, you’ll be in the mindset most suited to empathy and balanced reasoning. Throughout the call it’s beneficial to both you and the customer to show you understand the reasons for their anger. This shows the customer your intent to fix the problem and places you in a more positive light, right from the get-go. Highlighting your understanding of their problems can be achieved by reiterating the points they make and the issues they are facing. Confirm with the client that you have understood their problems by repeating the most salient points from their complaint. As Dale Carnegie once remarked, “A person’s name is to him or her the sweetest and most important sound in any language”. Whenever possible, and without overdoing it, incorporate the angry customer’s name into your conversation. For example, this can be effective after reiterating the core problems and asking for more clarification about the issues. Using the caller’s name shows you are truly focused and have their best interests at the front of your mind. As well as actively listening to your customer’s complaints and vocally clarifying their problems, it’s important to clearly explain it’s your role to help. This is best achieved at the beginning once you understand the customer is furious about a perceived problem. By explaining you will be with them until the issue has been rectified, you’ll quickly instill a sense of hope and security within the caller’s mind. Sometimes, all customers want is acknowledgment of a wrong and a simple apology. It’s amazing how powerful simply saying sorry can be and how it can rescue a faltering long-term customer relationship in an instant. Always be comfortable with offering a sincere apology when you have underperformed in some way or made a mistake. It might be the only thing required to quickly calm an angry customer. Anger seeks anger. When you’re furious with rage then you want nothing better than to provoke a response in someone else. An angry customer may well try to trigger an angry response from you. It’s important to speak calmly but assertively, guiding the conversation in a way that meets with a beneficial outcome for the upset customer. Make sure your voice is measured and soft. In so doing, your customer will soon match their tone with yours. Sometimes the issue causing the customer’s ire may not be something easily rectifiable within just a few minutes. In fact, it might be difficult to find the problem during the call itself without a deeper analysis. In this regard, it’s better to find a direct and beneficial solution to the customer’s problems and address the more fundamental issues once the call has come to an end. An effective way to prevent angry callers in the first place is to cultivate effective long-term relationships with your customers. Doing so ensures that if/when something does go wrong, there will be enough good will on their part to reduce the likelihood of reacting with anger. A few days or weeks after a tense call, it’s wise to follow up with the customer to see how they are doing. Ask questions which show you care and explain ways in which you can further improve their relationship with your business. Dealing with angry customers is never easy, especially when you are the business owner. Hearing a raised voice and some very choice words about your pride and joy can be very difficult. However, with patience, practice, and a certain professional detachment, you can quickly take the heat out of an angry call and even positively turn it around for the benefit of your reputation. As long as you remain calm, collected, fully attentive, and hold a genuine desire to fix the issues, then your brand should suffer no ill effects from the occasional and inevitable mistakes and faults.